I’m in love with this super quirky Gin Tea Cup and Saucer, if only I had room in my cupboards I’d buy the whole set! Described as an original and unique piece of functional art, lovingly designed and made here in the UK using the finest bone china, each tea cup is made from very high quality fine bone china and has beautiful gilt gold detailing. There are also other designs available, as well as teapots too! The Three Cheers for Tea set is also a lovely gift idea for tea lovers, it contains a triple pack of The London Tea Company’s finest blends, including Earl Grey, Sencha Green Tea, Peach & Rhubarb. Earl Grey: A blend of two bright black teas from Ceylon and the Nilgiris in South India. With added natural bergamot to give the blend a refreshing citrus aroma. Peach & Rhubarb: This is a blend of Fairtrade Hibiscus with peach and rhubarb flavours, creating a drink which can be enjoyed throughout the year; try it cold in a tall glass with ice and a sprig of mint. Sencha Green Tea: This is a steamed pure green tea, renowned for its clean fresh flavour. Perfect with a slice of lemon to add a zingy citrus twist to the classic Sencha taste and it’s Fairtrade! 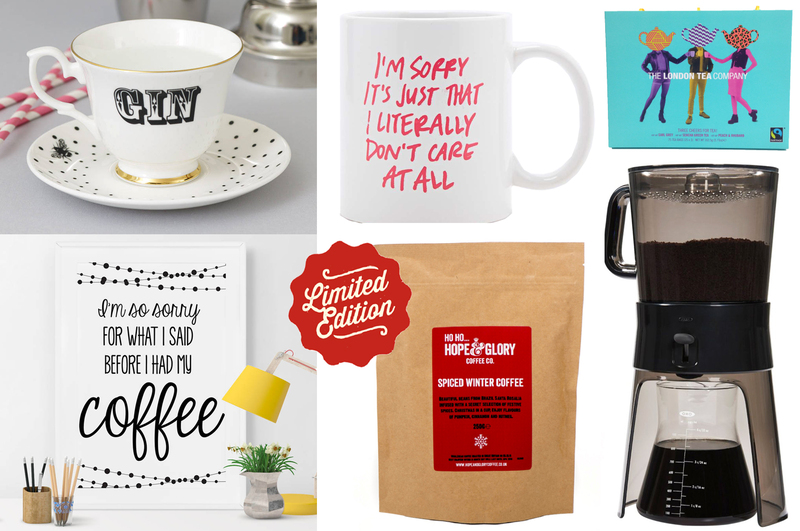 For the coffee lovers, what about a I’m So Sorry For What I Said Coffee Print? I love the simplistic monochrome design of this print, and the fact that it appeals to non moring people like myself! You also have the choice of luxury satin matt poster print (unframed) or a high quality canvas wrap print that’s ready to hang on the wall. Another one for coffee fans, what about some gorgeously seasonal Spiced Winter Coffee? Blended with a spike of pumpkin, cinnamon and nutmeg spice, this is literally Christmas in a cup for coffee drinkers! And whether you love tea or coffee, or both, there’s the Cold Brew Coffee Maker! This coffee maker simplifies the cold brew process to deliver smooth, low-acid coffee. As the grounds never come in contact with hot water, the result is a less acidic and less bitter flavour. It turns out that steeping the grounds in cold water releases only the most aromatic flavors, and the concentrate created from the cold-brew process stays fresh longer than regular coffee. This Coffee Maker has all the hard work covered – all you have to do is add coffee grounds and water. Once you make the concentrate, you can add ice and water for iced coffee or hot water or milk for hot coffee. If you’re a tea lover, you can use the same process to cold brew tea! With a flick of a switch, the stainless steel filter strains your favourite tea into a sealable, glass carafe, Genius!